Wild Florida Adventures - A story in the Gainesville Sun Adventures Quarterly - Summer 2000 edition. Sea kayaking is a sport as diverse as its element. Whether seeking the challenge of pitting yourself against a cold ocean, or the peace and serenity of slipping over warm waters powered only by a paddle, there is a place to fulfill your kayaking dreams. The sheltered nearshore Gulf waters around Shell Mound are a sea-kayaker's playground. 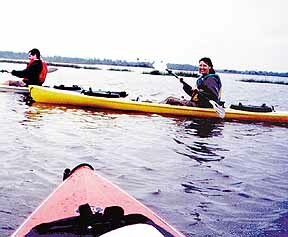 One of the most appealing locations for Florida sea kayaking is the near-shore Gulf waters around Shell Mound, just north of Cedar Key. This is a sea kayakers playground, a shallow ocean area often only inches deep over hidden oyster bars, cosseted among barrier islands and thick with wildlife. For inexperienced sea kayakers, these serene waters are a safe, accessible place to get comfortable with ocean kayaking without the interference of constant motor boat traffic. Experienced kayakers will love the area for its tranquil beauty or as a jump off point for greater adventures, such as paddling five miles up the coast to the Suwannee River, or wilderness camping on Clark Island, just an hour paddle north of Shell Mound. "The entire Gulf coast is a low energy system," says Joni Ellis, environmental educator with the Fish and Wildlife Service in Cedar Key and also co-owner of Wild Florida Adventures, which offers group kayak touring trips around Shell Mound. For the layman, she explains, this means no big swells or pounding breakers, a plus for kayakers. Most of the islands dotting the area are part of the Cedar Key National Wildlife Refuge. All are low-lying and surrounded by extremely shallow sand, mud or rass flats. Kayak is probably the ideal way to reach these lovely keys. Beach access is permitted on all the refuge islands adjacent to Shell Mound, offering delightful rest stops to break a journey, plus the rare opportunity to see wildlife in an untouched, natural environment. On a recent trip with Wild Florida dventures we launched four brightly colored kayaks from the beach on the Cedar Key National Wildlife Refuge portion of Shell Mound, located at the end of CR 326. The beach provides an easier launch site for kayaks than the roughened cement public boat launch maintained by the county, and is just a half-mile on from the county park where a campground, public restrooms, showers and picnic tables are available. Parking is adjacent the beach launch site. For the novice kayaker, one of the real benefits of the sport is the simplicity of the equipment. Although only my third time in a kayak, it took just a few minutes of instruction on the beach to remember correct paddle grip and technique. Even so, until seated in the craft with the paddle in my hands, I had forgotten how easy it is to propel a kayak. In moments we were gliding away from shore, slipping silently over the green-brown waters of the Gulf. The view from a kayak cockpit is like no other boating experience. From my water-level seat, I had to agree with whoever said "kayaking is like being one with the water." The low center of gravity and body-sized cockpit makes the craft feel like an extension of yourself. There is a sense of being part of nature, rather than an interloper, and even the shortest journey suddenly becomes an adventure. We aimed north from Shell Mound, leaving low Hog Island to our left and skirting the grassy edges of tiny Garden Island. More than once we saw a lone Great Egret, motionless in the shore grass as we glided past, a sight so perfect in form it made me itch for the zoom lens left behind. Even so, by the time we rounded Buck Island and pulled up on its gravely beach (about an hour's paddle from the Shell Mound launch) it was time for a break. Wood- and scrub-covered Buck Island has panoramic views westward over the Gulf and southward toward the other keys of the refuge. After a brief walk, to shake the kinks out of our legs, we were back in the boats. Headed south, we skirted a sand spit on Hog Island, crowded with cormorants and oystercatchers, bright orange bills shaped for prying open shells. To the south lay Derrick Key, a rookery for white and brown pelicans, where the Ellises often take kayakers for a beach picnic with real napkins, silverware and china. On this day, a light rain turned us regretfully back to Shell Mound. It is hard to make any excursion into nature, however brief, and return unchanged. Perhaps it is the tranquility of gliding over water with only the sound of a dipping paddle that leaves the kayaker with such a profound sense of connection with nature. Whatever the reason, Shell Mound offers its own special brand of serenity, waiting to be discovered. When kayaking, long-sleeved, light shirts are recommended for sun and insect protection. Reef-runners or old sneakers are best for negotiating muddy or oyster shell shores. Kayaking is a wet sport. Cameras, binoculars and any valuables should be kept in air-tight bags.